TAMPA – Stream Recycling’s Tampa facility is where old data goes to die. Customers pay the Tampa electronics recycler to destroy and recycle everything from hard drives to modems. But this Saturday from 9:00 a.m. to 1:00 p.m. Stream is offering its waste services for free. 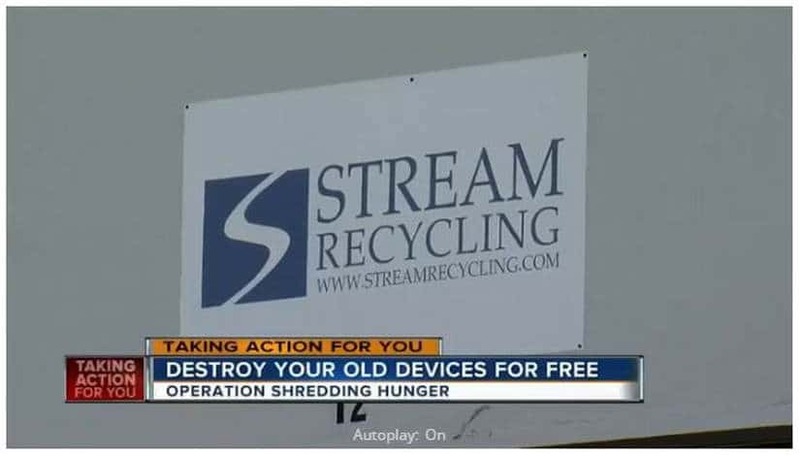 Stream and paper shredder Proshred plans to set up shop at Feeding Tampa Bay where they will destroy your old papers and electronics.All you need to do to take part is show up at Feeding Tampa Bay Saturday with ten non-perishable food items or a $10 donation. Papers will be shredded on site and data filled electronics such as hard drives will be placed inside Stream’s locked truck, transported to their facility and destroyed. In one stop you can protect your identity and help to feed the hungry in the ten county area Feeding Tampa Bay serves. Feeding Tampa Bay is located at 4702 Transport Drive, building 6 in Tampa.